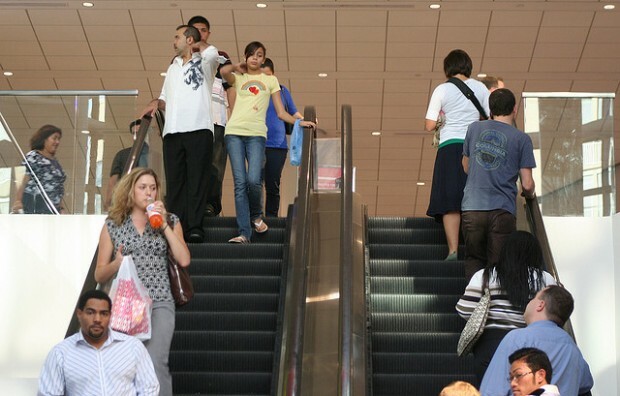 A diverse group of people ride up and down escalators at DC USA in Columbia Heights. D.C. experienced dramatic demographic changes in 2011. It’s gotten more expensive to buy a home. D.C.’s housing prices increased by 1.3 percent this year, according to the S&P/Case-Shiller index. Meanwhile, housing prices in other cities have remained steady or have dropped. Rising home values can be a result of gentrification — as a neighborhood becomes more desirable, demand for homes increases, which drives value up. Fewer African Americans and more whites and Hispanics live here. This year, D.C. lost its status as “Chocolate City” after more than four decades of being a majority black city. Meanwhile, the white population increased by more than 30 percent and the Hispanic population by 20 percent. That revelation prompted folks to reflect upon what such changes mean for the city’s neighborhoods, culture and political scene. People are moving in at a record-breaking pace. For the first time in 70 years, D.C. leads the nation in population growth. The District’s population grew by 2.7 percent between April 2010 and June 2011, according to Census data. The income gap grew between whites and blacks, and the rich and the poor. Whites earn $3.06 for every $1 African Americans earn, making D.C.’s racial income gap one of the largest in the nation. This has happened while D.C.’s suburbs saw a decrease in the income gap between whites and blacks. Among cities with 100,000 people or more, the District comes in third for highest income inequality, a measure of how evenly distributed wealth is among a population. Such income inequality is one of the major grievances fueling the Occupy movement, which began in 2011 and spread to cities throughout the world, including D.C. There are more jobs, but unemployment increased. Since 2009, job openings have risen throughout the country. In D.C., the private sector grew by 17,100 jobs this year. Despite this, D.C.’s unemployment rate is higher than it was in 2010. A number of factors cause high unemployment in parts of D.C., which we examined this year in our “Division of Labor” series. I would just like to see how City Council looks in the next few years. I bet totally different.